Lock in a great price for Jumeirah Vittaveli – rated 9 by recent guests! The hotel room and staff are nice. However, I don't understand why the hotel allowed the renovation to begin at night time while their guests were at rest. If I were the manager of the resort, I would either prohibit the mid-night work or place their guests away from the renovation area. With this high hotel room charges, I expect more than this. Service was great , clean, organized, amazing view and privacy... everything was great! Choose the 600 series rooms for water villas. Thumbs up for the Staff for being super polite and did try their best to keep us comfortable. They attended all the calls with top priority. The team in the restaurant were amazing. They made what ever we had asked for and truly made us feel, home away from home !!! The water sports were nice as well. The instructors too were really polite. Extremely friendly staff and great service. Beach villa was very spacious and private. B4dinner sunset lounge. Special welcome and farewell ceremony. Though the facility is remarkable and is built while putting in mind costumer comfort and relaxation needs, the most incredible experience was with the staff. I've never come across any hotel that makes you feel very welcomed and so friendly to the extent you feel you now them from years before. Jumeirah Vittaveli This rating is a reflection of how the property compares to the industry standard when it comes to price, facilities and services available. It's based on a self-evaluation by the property. Use this rating to help choose your stay! One of our top picks in South Male Atoll.Jumeirah Vittaveli provides extensive leisure and wellness facilities including a 5 star PADI dove center, Talise Spa and Talise Fitness. The Talise Spa is surrounded by lush, natural gardens and offers Asian inspired treatments using organic or natural products. The first of its kind in the Maldives, Ice Ice Maybe, an artificial ice skating rink offers a unique experience where guests can watch from the benches or play ice hockey at a surcharge. Vittaveli Jumeirah's 5-star villas feature an open-concept layout that lets guests take in stunning sea views and cool breezes. All villas offer private pool and direct access to the beach or lagoon. Free in-room WiFi access is available. Guests may sample a range of Asian and Maldivian specialties at Samsara. or enjoy an intimate dining experience over lagoon waters at Fenesse. Evening cocktails are available at Mu Beach Bar and Grill, as well as B4R. The signature restaurant Swarna invites for opulent 18-course Thalis or set Journey menus in private cabanas set in a lush Maharajah style garden. Daily yoga and fitness classes as well as personalized wellness programs are available. The property has one of the largest kid's clubs in Maldives, Kuda Koli Kid's Klub. The property provides free snorkeling equipment and non-motorized water sports. Union Pay is accepted at the property. When would you like to stay at Jumeirah Vittaveli? 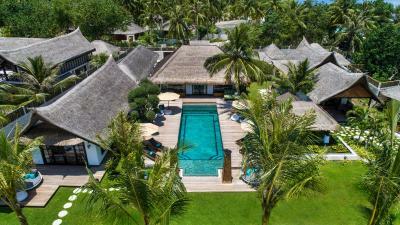 Features a private swimming pool with direct access to the beach, with an open-air bathroom with marble bathtub, swing and dressing area with a spacious walk-in wardrobe and solid wooden flooring. Room can accommodate up to 2 adults. Room rates do not include boat transfers. Offers stunning sunset views, a private swimming pool with direct access to the beach, with an open-air bathroom with marble bathtub, swing and dressing area with a spacious walk-in wardrobe and solid wooden flooring. This two bedroom suite are appointed over two levels and are perfect for families. The suite features a private swimming pool, a separate living room and a spacious master bedroom with private bathroom on the first level, with the children's bedroom with twin beds and private bathroom and an outdoor terrace on the second floor. Room can accommodate up to 4 adults. Room rates do not include boat transfers. Two-bedroom duplex features a beachfront private pool, a spacious interior and a rooftop terrace with stunning views. The master bedroom with a king-size bed has an interconnecting door to the second bedroom, which has two twin beds. Spend your first 2 nights in a Sunrise Beach Villa and the next 2 nights of your stay in a Sunrise Water Villa. Features a private swimming pool with direct access to the beach or lagoon, with an open-air bathroom with marble bathtub, swing and dressing area with a spacious walk-in wardrobe. Spend your first 2 nights in a Sunset Beach Villa and the next 2 nights of your stay in a Sunset Water Villa. This villa features a tile/marble floor, air conditioning and sofa. This villa has a private entrance, bathrobe and private pool. · In-Villa High Tea every day. · Family Beach BBQ, once during stay. · Maldivian Cooking Class followed by Lunch, once during stay. · Fruit basket upon arrival. · Private swimming pool with every villa. · Exclusive access to private, pristine beach or lagoon. · Wi Fi access all around the resort. · Complimentary access to non-motorized water sports and snorkeling equipment. This suite features a tile/marble floor, sofa and private entrance. The Royal Residence at Jumeirah Vittaveli features five-bedrooms with a main Sanctuary, two Guest Villas and a two-story Guest House, offering the perfect private hideaway to share with family and friends. Stretching over 3,000 square yards, Royal Residence features a private spa pavilion, gym, swimming pool, outdoor and indoor living areas, stunning bathrooms, and a dedicated Teppanyaki restaurant as well as a fully stocked professional kitchen by nolte™ with a wine cellar. The double-story suite features a wooden veranda with direct access to clear lagoon waters. a private infinity edge pool, over water hammocks and equipped with a sunken indoor bath and rain shower. Room rates do not include boat transfers. Please note that it is not recommended for children under 12 years to be in this room type for safety reasons. The Three-Bedroom Royal Residence spans over 3000 square yards, with two king beds and two twin beds. 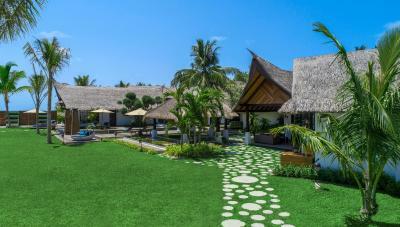 The residence features a private beach, dedicated Teppanyaki style restaurant, fiber-optic lit swimming pool and a sundeck with over water bar. The Residence comes equipped with five flat screen TVs with surround sound system and a private fully stocked modular kitchen & a fully stocked bar. This villa features a balcony, tile/marble floor and air conditioning. This villa has a balcony, soundproofing and iPod dock. This villa features a balcony, soundproofing and barbecue. Jumeirah Vittaveli is the most luxurious resort comprising the best house reef within easy reach from Male’s international airport on-board our plush fleet of motorised catamarans. House Rules Jumeirah Vittaveli takes special requests – add in the next step! Any additional older children or adults are charged USD 360 per night for extra beds. Jumeirah Vittaveli accepts these cards and reserves the right to temporarily hold an amount prior to arrival. Seaplane from Male International Airport. Romantic bubble bath, Complimentary bottle of sparkling wine, Complimentary fruit basket and Romantic bed decoration. Guests are entitled to the above credit amount in Samsara, Fenesse, MU Beach Bar & Grill, Swarna, or Destination Dining credit.